Owing to the investment this purchase represents, only 5% of dentists regularly use the laser. It represents one of the major technologies of modern dentistry. "After several years of use in our clinic, the laser has become an indispensable instrument and perfectly integrated in many protocols. The choice of its use is always positive by the precision of the act, the time gained and the well-being brought to our patients during and after the care. " It can vaporise a decayed tissue while preserving the maximum of healthy tissue. It can also decontaminate a dental cavity while maintaining the pulp vitality of the tooth. 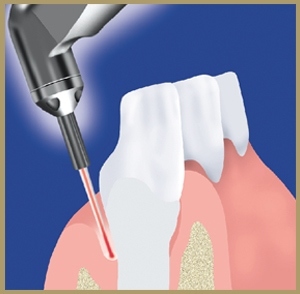 The laser can close or reduce the diameter of the dentinal tubules. Owing to the diameter of the new fibres, the laser energy facilitates decontamination of all the micro-canalicules of the dental canals (using 10 volumes of oxygenated water). Gum pain, bleeding brushing, moving teeth, etc. – with the laser, it is now possible to improve the prognosis of these diseases and to keep the teeth. The dentist uses penetrating radiation under 10-volume oxygenated water after initial preparation. The earlier the treatment is performed, the more the result remains stable. The laser’s radiation has a decontamination and biostimulation power that accelerates Healing. the laser makes it possible to modify the outline of the gums in order to improve the appearance of the teeth and to make the smile more attractive. By sculpting or cutting the soft tissues, the laser makes it possible to expose more the natural tooth (elongation of the crown) in the case of a gummy smile, either to reduce the amount of gums of smiles too long (gummy smile). Suppression of vibrations and unpleasant noises; provides better comfort to patients. No bleeding; significantly reduces the inflammatory reactions. The extreme precision of the laser beam provides greater safety by protecting surrounding healthy tissue. At the end of the session, the patient’s face is often less numb because, in many cases, anaesthesia is no longer essential. Healing is faster. 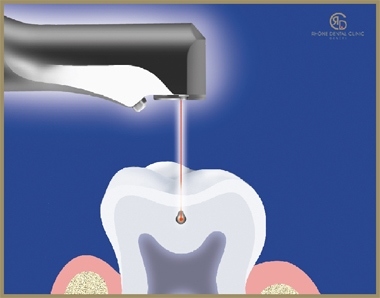 Laser treatments improve the success of endodontic therapy thanks to their bactericidal effects.